Emerging Western Australian nickel company St George Mining Ltd (ASX:SGQ) has delivered further strong results from drilling at the Mt Alexander Project, located near Leonora in the north Eastern Goldfields. 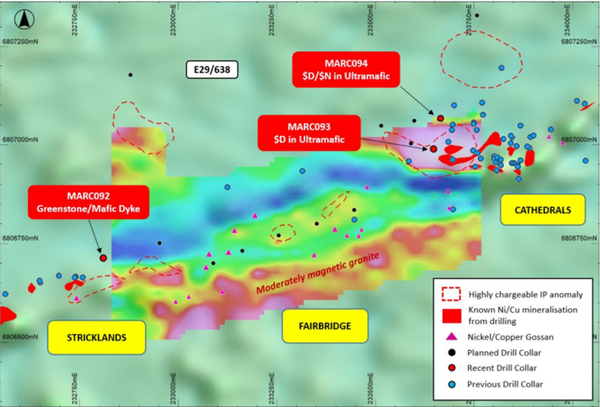 Two drill holes, MARC093 and MARC094, have been completed at the eastern margin of the Fairbridge Prospect to test an anomaly that is interpreted to be the western extension of the mineralised ultramafic at the Cathedrals Prospect. Cathedrals is one of three discoveries that St George and its 25% joint venture partner, Western Areas (ASX:WSA) has made in recent years. As well as Cathedrals, the Stricklands and Investigators discoveries feature nickel-copper-cobalt-PGE mineralisation. The map below shows the sites where current drilling is taking place. Sites where current drilling is taking place. Both drill holes intersected thick intervals of ultramafic rocks and nickel sulphide mineralisation. MARC093 was completed to a downhole depth of 178 metres, while MARC094 which was drilled to the north of MARC093 was drilled to a depth of 226 metres. The interim results demonstrate that the mineralised ultramafic dips to the north, with stronger nickel sulphide mineralisation at depth. Significantly, a large chargeable anomaly has been modelled to the north of MARC094, at a vertical depth from surface of approximately 250 metres, and the first ever drilling of this large anomaly is scheduled for this week. Commenting on these recent developments, St George Mining’s Executive Chairman, John Prineas said, “The drill programme at Mt Alexander continues to deliver exciting results and further hits of thick nickel sulphide mineralisation. “Initial drill results at Fairbridge fit very well with our geological model for the Cathedrals Belt, which interprets the ultramafic unit dipping to the north with potential for further mineralisation down-plunge. Argonaut’s resources analyst Matthew Keane has a speculative buy recommendation on the stock, and in response to recent developments said, “We are highly encouraged by the current strategy to step out of known mineralised zones to potentially extend the scale of the project. He noted that there have been virtually no false positive electromagnetic conductors at Cathedrals Belt, providing the company with significant confidence regarding the reliability of its data in shaping the group’s exploration program. 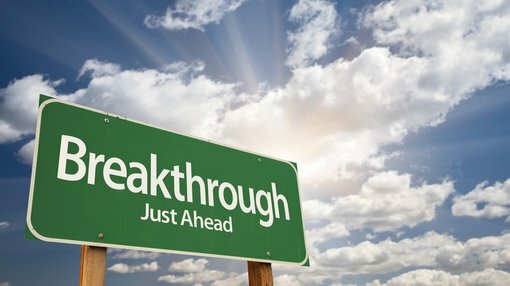 The establishment of a maiden resource would have to be considered as the most significant medium-term share price catalyst. However, should the company continue to experience drilling success, this will be interpreted as beneficial in terms of establishing a quality maiden resource, potentially providing share price momentum leading up to this event. While shares in St George were sold down in late 2018, this appeared to be a function of negative sentiment in broader equities markets. Arguably, a better indicator of the company’s performance is the sharp increase in its share price in the last month, during which time it has surged more than 30% from 12.5 cents to yesterday’s close of 16.5 cents. This rerating has occurred under larger than normal daily volumes, and significantly higher volumes than those that were apparent in the downtrend in late 2018.